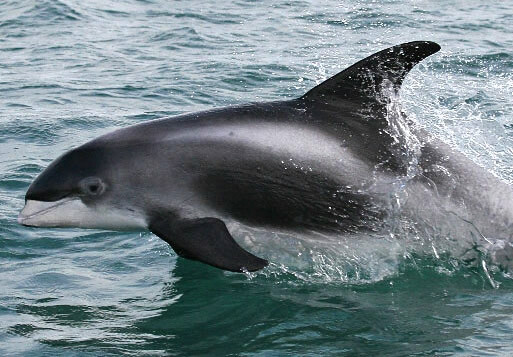 The white-beaked dolphin (Lagenorhynchus albirostris) is a large and very robust dolphin, with a short rounded beak and a tall, falcate dorsal fin. Its pectoral fins are large and broad based also, with pointed tips. The tail stock is thick and there may be a keel above and below the tail stock. This dolphin has a distinctive colouration. Its dorsal and lateral surfaces are dark or black in colour, and the belly is white as far back as the middle of the tail stock. White or grey markings are distinctive on the sides and flanks of the animal: an elongated white blaze originating above the flipper and extending along the flanks and over the back behind the dorsal fin; and grey white blazes on the thorax and the flanks, which may be flecked with black streaks. The lip and beak are white, with as large grey beak blaze and grey area at the tip of the lower jaw. The blowhole is surrounded by a dark grey patch, which is almost circular in shape. The white-beaked dolphin is a fast and powerful swimmer, and may bow-ride, especially in front of large, fast moving vessels. It can be active at the surface, breaching and leaping. White-beaked dolphins are found in the cool and sub-arctic waters of the North Atlantic Ocean. They tend to be more coastal than the pelagic white-sided dolphin, and favour continental shelf seas. Their distribution, however, is still very similar to, although slightly more northerly than, the Atlantic white. The species is common in the North Sea, around the Northern Isles and Hebrides of Scotland, the Faroes and, seasonally, along the coast of Norway, southern Barents Sea and south-western Sweden. Sightings in the UK occur mainly off north, north-east and north-west Scotland. Migrations in this species are not well known or understood, but there may be some north-south movements between summer and winter. The species may be found in coastal areas of northern Britain in all months of the year. Maximum lengths of 3.5 m for a male white-beaked dolphin and 3.05 m for a female have been recorded. White-beaked dolphins become sexually mature at an average length of about 2.6 m in both males and females. Mating is thought to occur in the warmer months of the year and calves are typically born in the summer between June and September. Off Newfoundland, Canada, white-beaked dolphins have been reported to eat cod and in the Hebrides, NW Scotland, they are often associated with mackerel shoals. Other prey items include squid, octopus, cod, herring, capelin and sometimes benthic crustaceans. White-beaked dolphins have been observed to use fish herding techniques, including; small groups of dolphins converging in an area, gathering the fish in the process; using echelon formation, moving in the direction of a small group of dolphins, to trap the fish; and rushing to the surface in a group lined up abreast, while other dolphins converge on them to trap the fish. These techniques of herding seem to panic the fish, which scatter, and are picked off by the dolphins. Herding fish in this manner is highly cooperative, requiring synchronisation of dives, surface rushes and re-grouping. Individuals may communicate with others in the group (as well as corral fish) using whistles, breaches, tail slaps and somersaults. The white-beaked dolphin has been reported in large schools, up to several hundred individuals in the eastern Atlantic, but mostly occurs in smaller schools in the western Atlantic. Around the UK, most sightings are of groups of less than 10 animals, although larger pods of up to 500 have been recorded. This species sometimes associates with other small cetaceans such as Atlantic white-sided, Risso’s and bottlenose dolphins.